Slomo is a helpful app to practice a song, master a solo and learn to play by ear without the need of musical background theory. Ever wanted to know how to play that tricky part? With Slomo it's easier than ever. 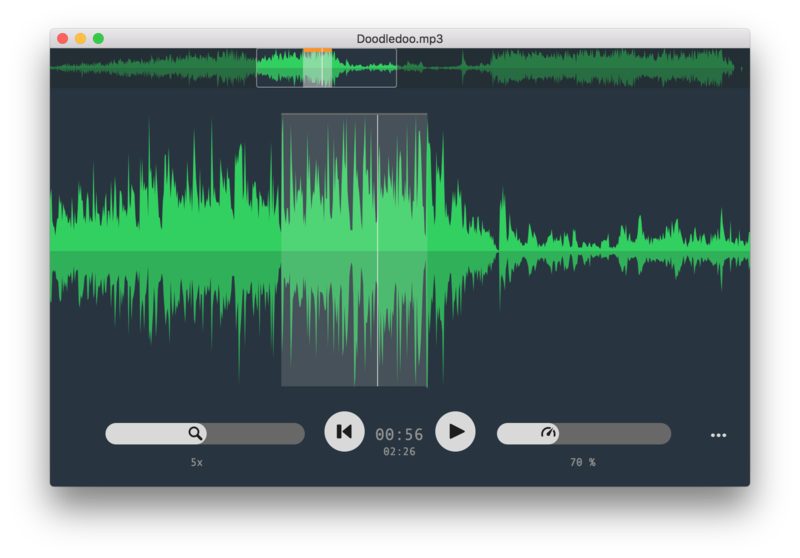 Navigate through the audio track intuitively with the help of the overview waveform and the zoomable detail view. Lotsa keyboard shortcuts gives you full control and helps to focus on your instrument. Create and store as many loops as you need. 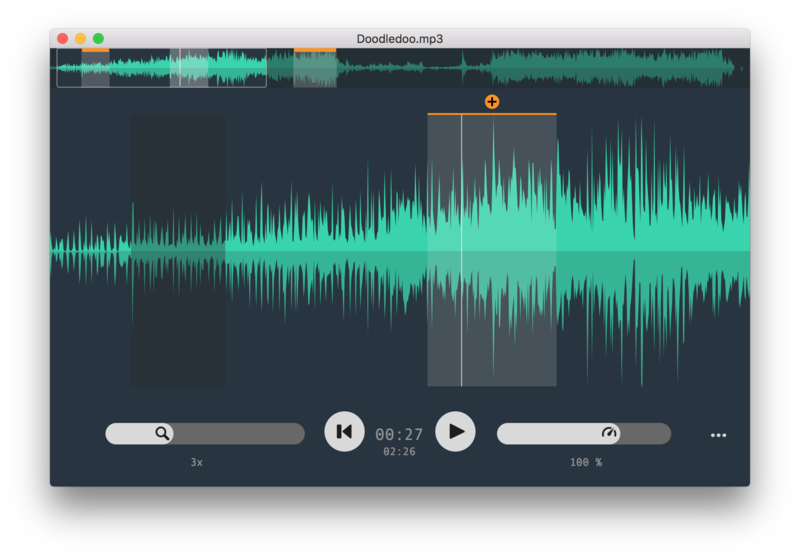 All loop markers are saved with the song and are available next time you open the song. 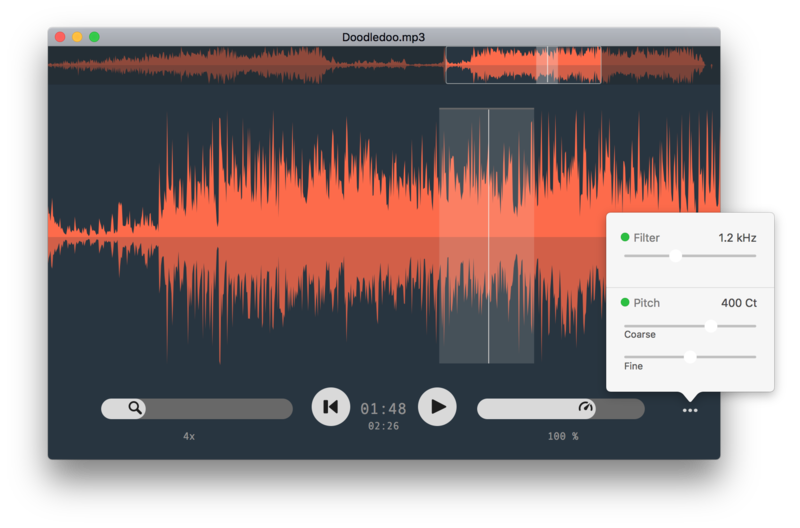 Emphasize the instrument you want to hear while suppresssing others with the easy-to-use filter sliders. Slomo supports now the new Touchbar. Skip easily through your loops and adjust your playback speed. "Which file formats are supported?" Slomo handles .wav, .aiff, .mp3, .aac, .m4a, .m4b and .caf-files. Currently no .ogg, no .flac. "I cannot drag a song onto the app from iTunes"
Be sure to use your local library. Tracks from an iTunes server or another computer's library can't be dragged anywhere. "Nope, I just can't open that song"
It is probably a copy protected track, which we do not support for now. Nevertheless those are pretty seldom these days. "Why is there only one track regardless of stereo or mono files?" The waveform shows the left channel in the upper half and the right channel in the lower half of the view. "I've found a bug. Shall I rate the app with one star?" Hmm..., no. Please contact us. We always love your feedback and are happy to help." "I love Slomo. How can I spread the word?" If you enjoy our first application, make us happy by rating Slomo in the Mac App Store and tell your music loving friends about us.